In Munster, Ind., beer lovers line up once a year to throw down serious cash for six big bottles of Three Floyds Dark Lord Russian Imperial Stout. In Texas, the once- or twice-a-year release of the latest Saint Arnold Divine Reserve brew is eagerly anticipated and then snatched up by only those who time their visit to just the right store at just the right time using intelligence-gathering techniques that stop short of warrantless wiretaps. Across the pond in Belgium, the rush to get one of the world’s best regarded beers caused the monks at Westvleteren who produce it to keep it all to themselves for a time while they revamped their purposely archaic distribution system to one even more stringent. Rare wines are not a new phenomenon, but it is emerging in the beer world in a big and sometimes strange way. Getting a limited-release wine can mean being on a waiting list for years, becoming a regular at a high-end restaurant that has a better chance of getting it or sometimes just a simply outlay of cash – lots of it. But when it comes to limited edition beers, tactics include obsessive intel gathering, camping out at the brewery, costume changes, long road trips and cross-country trading. Three Floyds has a hard enough time just supplying its standby brews like Gumball Head and Alpha King to Indiana and Illinois, but when the annual release of Dark Lord rolls around, the situation becomes a little nutty, said Liz Harrison, a bookkeeper at the brewery. The first Dark Lord day several years ago was a sleepy, little event, but by 2006, a respectable 500 showed up to enjoy the 13 percent alcohol brew that is ranked No. 3 in the BeerAdvocate.com top 100 by users of the site. In 2007, there were 2,500, and this year, in late April, about 5,000 people gathered round to get a crack at buying six 22-ounce bottles. Ms. Harrison said some young fans of the beer have tried climbing through windows to get their hands on it. Some have resorted to stealing. Others exhibit their excitement by camping out and enjoying the camaraderie of like-minded drinkers from the region and even as far away as Japan. It is common, she said, to see people dealing with others farther up in line to buy a portion of their haul at a higher price. One strategy for Dark Lord Day spelled out at in a message board thread on Beer Advocate.com involved a man with a large beard going through the line once and then shaving the beard and changing his shirt to make a second trip through the line. The neck of the bottle is dipped in a different color of wax each year, and Ms. Harrison gets calls in advance of the release asking her what color the wax will be. Saint Arnold doesn’t make the release of its Divine Reserve into an event, but it does become a game of skill and timing. Only 300 cases of Divine Reserve No. 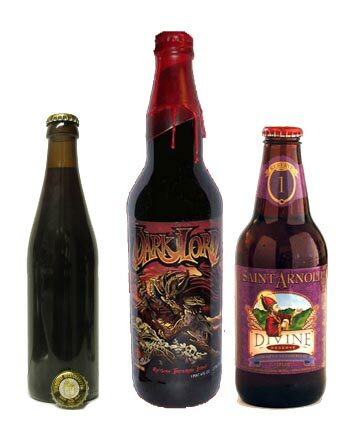 1, a barley wine, were released, and only a lucky few in the Houston and Austin areas scored any. But it created such a buzz in the Texas beer community that even a 500-case run of an American-style quadruple ale didn’t last until noon in most stores. There should be about 1,000 cases of Divine Reserve No. 6, a new barley wine recipe by brewer Michael Harris, available as early as this weekend but it will take some smooth moves to acquire one. Those lucky enough to hoard the vaunted No. 5 Russian Imperial Stout from early last year have a powerful tool for trading for other limited beers from microbreweries around the country. “People take time off work to get it,” said Ann Crivello, head of customer service and events at Saint Arnold. “They try to feel people out at the stores to figure out when it might come in” and then build their schedule around it. The fervor around certain beers is generally good fun, but at times it has created problems that garnered national attention. Westvleteren 12, made by one of only six breweries in the world run by Trappist monks, was already sought after by beer aficionados around the globe because of its reputation, quality and relative scarcity. But by 2005, when RateBeer.com named it the best beer in the world and it topped out at No. 1 on the BeerAdvocate.com ranking, the monks at the Abbey of Saint Sixtus decided it was time to stop the madness. They already forbid the resale of the unlabeled bottles for commercial purposes, but entrepreneurial gray market importers ignored that to feed the demand and made frequent trips to the abbey brewery to pick up a few crates. The monks steadfastly refused to make more and only sell as much as they must to maintain their spiritual way of life. When they started selling the beer again in late 2006, the system involved calling the abbey’s “beer phone” to see if any of the brews were available and pre-ordering before heading to the monastery. Once there, each car is limited to a single case where once up to 10 cases could be purchased. Now the Japanese brewery Sapporo has announced it will brew 100 bottles of beer with barley grown from seeds nurtured in space. They haven’t decided just how to parse out those bottles, but it is sure to set off a craze in Japan that will make American beer enthusiasts seem like pikers. Please read the comment before yours…dude! I’m going to keep this comment clean and simple. Limited Edition Beers: The Hot New Thing??????????? ?” Are you kidding me? This has always been the essence of craft brewing. I’m sorry that I’m being rough Dan, but I’m glad you finally got the point. Keep drinkin’ the good stuff (Just like it says on the bottle of a Scottish Porter from Flying Dog> Road Dog) – via Hunter S. Thompson, “Good people drink good beer.” To expound on good beer and it’s old slogan, you should give lipserve to a High Desert Barley Wine. Try a Short’s Hopilicious, posssibly a Founder’s Kentucky Bourbon Barrel Stout, or a Jolly Pumpkin Maricaibo Especial. Look for Scotty Karate Scotch Ale from Dark Horse, or a Maltilda from Goose Island. Just savor, a Vertical epic series , or any thing for that matter, from Stone or a McMinnemans from the past, or present. Bite into a Surly, a Tyranena or New Glarus today. Maybe, …… ahhhh….. I could go on, but I’d be redundant. Dan, it’s not a new thing. Support your local brewery. Big, Chewy beers are out there- drink up!!! Peace , love and propagation. This is an article originally written by Travis Poling for the San Antonio Express-News who is a big supporter of the craft beer industry. Thanks for the great piece, Travis!